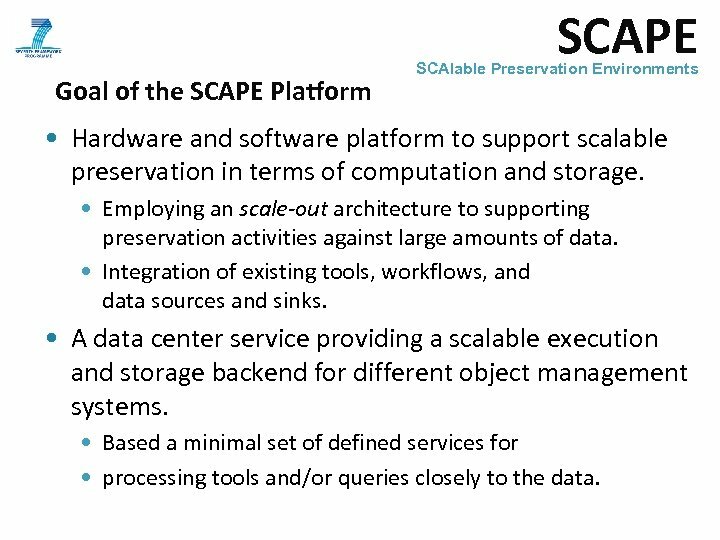 SCAPE Goal of the SCAPE Platform SCAlable Preservation Environments • Hardware and software platform to support scalable preservation in terms of computation and storage. 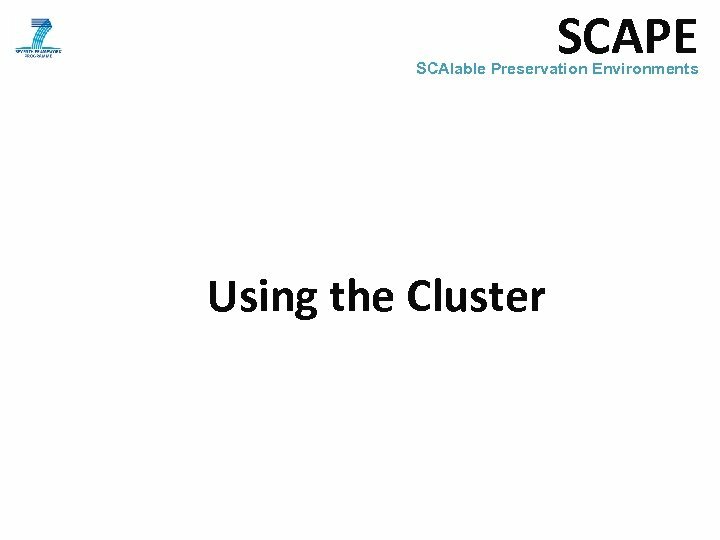 • Employing an scale-out architecture to supporting preservation activities against large amounts of data. 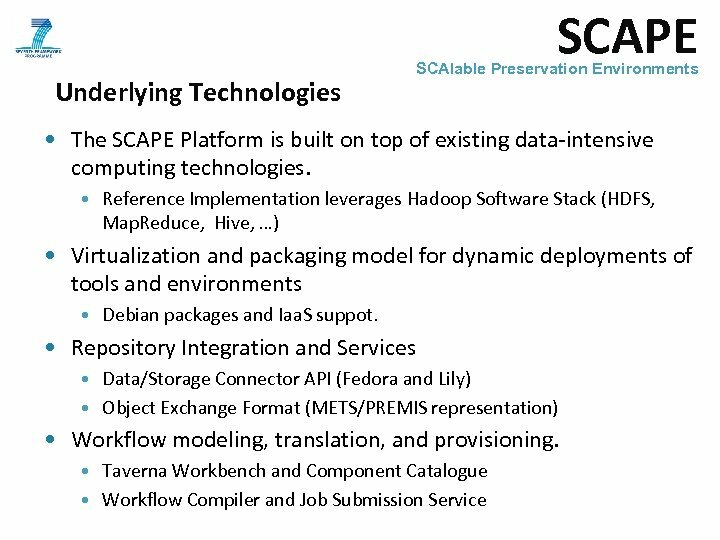 • Integration of existing tools, workflows, and data sources and sinks. 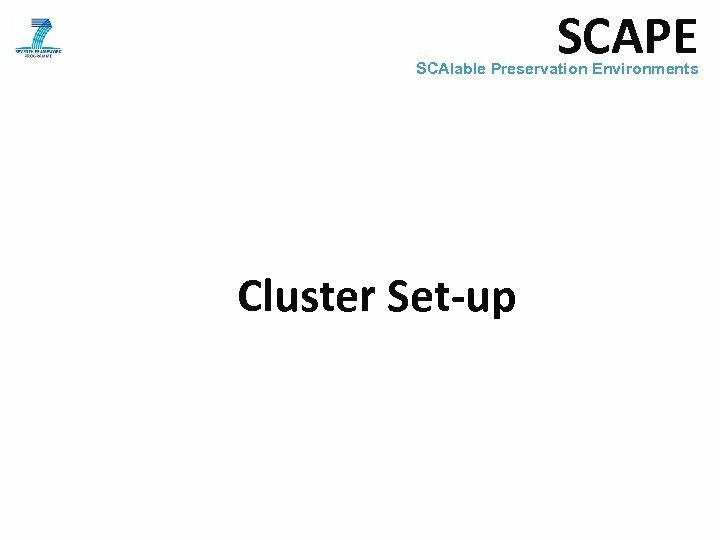 • A data center service providing a scalable execution and storage backend for different object management systems. 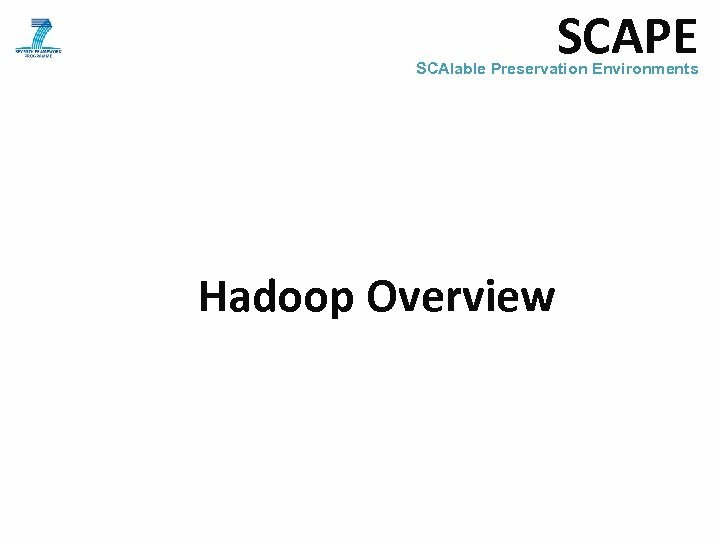 • Based a minimal set of defined services for • processing tools and/or queries closely to the data. 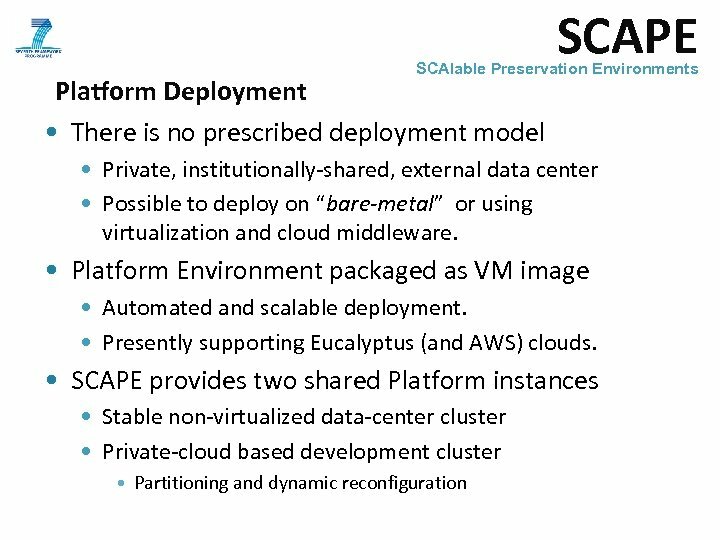 SCAPE SCAlable Preservation Environments The Framework • Open-source software framework for large-scale dataintensive computations running on large clusters of commodity hardware. 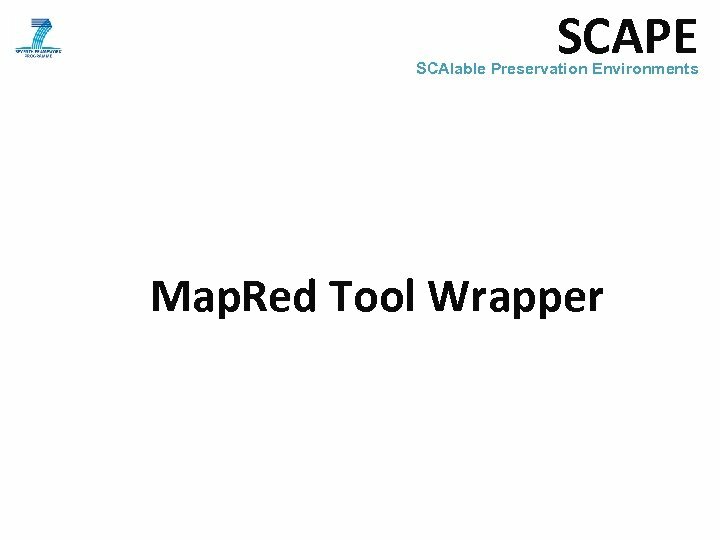 • Derived from publications Google File System and Map. Reduce publications. 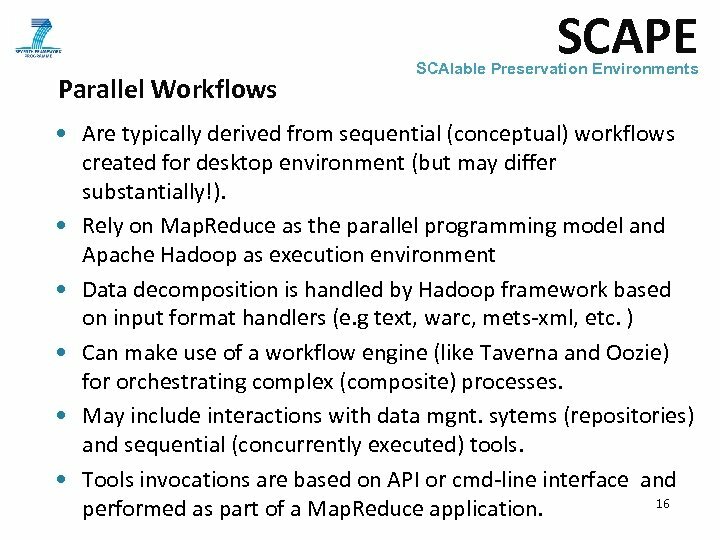 • Hadoop = Map. 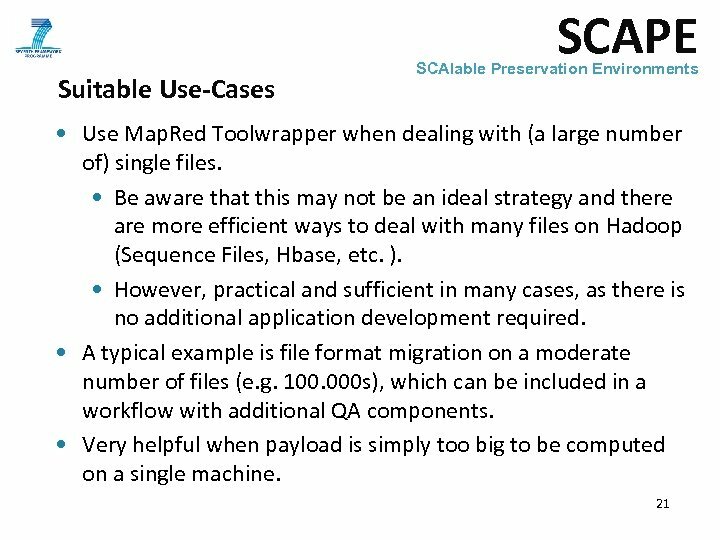 Reduce + HDFS • Map. Reduce: Programming Model (Map, Shuffle/Sort, Reduce) and Execution Environment. 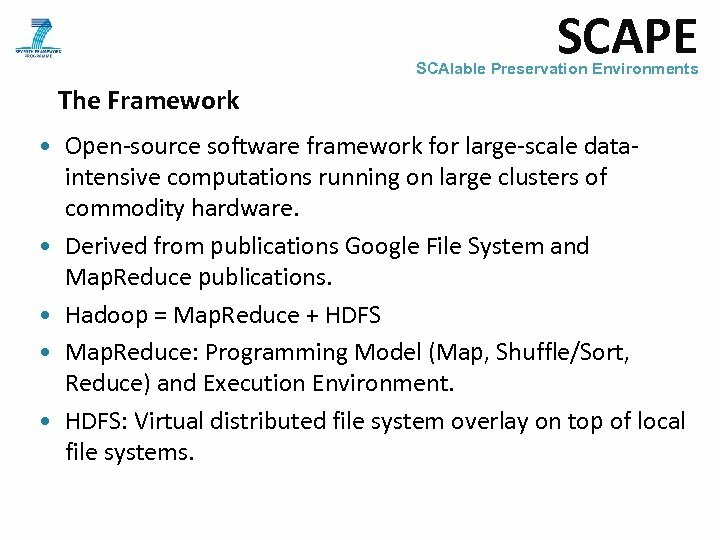 • HDFS: Virtual distributed file system overlay on top of local file systems. SCAPE SCAlable Preservation Environments Programming Model • Designed for write one read many times access model. 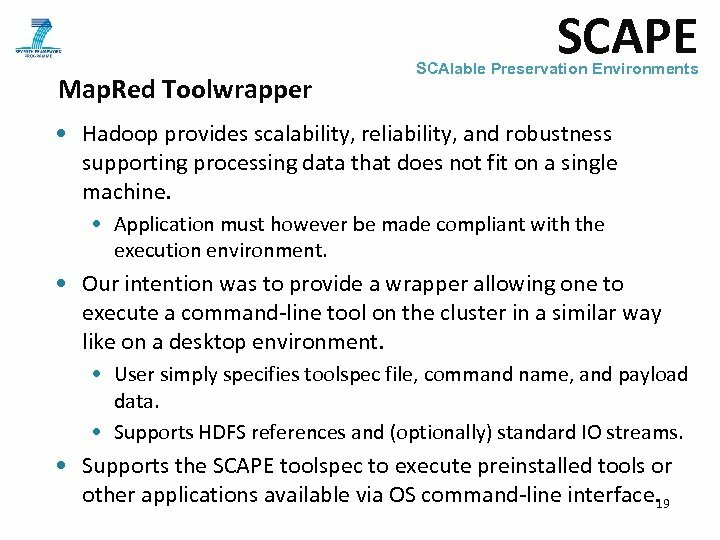 • Data IO is handled via HDFS. 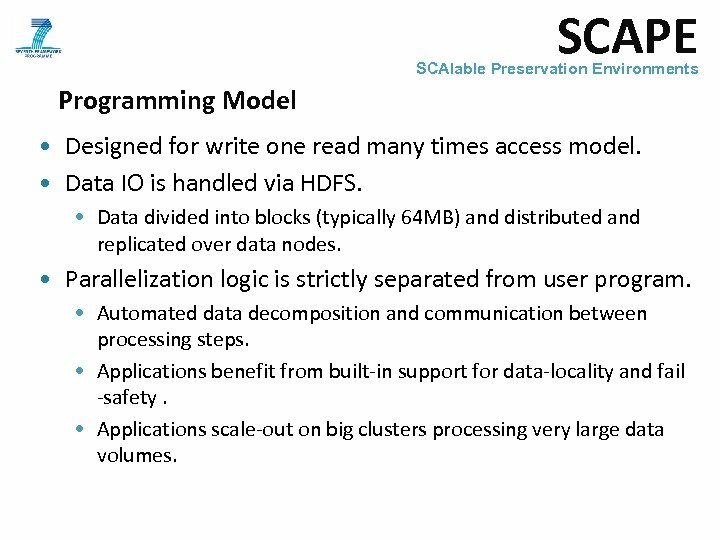 • Data divided into blocks (typically 64 MB) and distributed and replicated over data nodes. • Parallelization logic is strictly separated from user program. 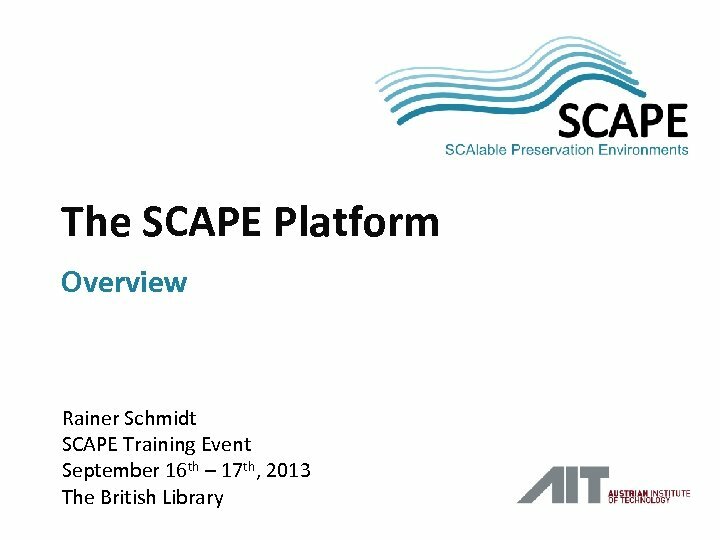 • Automated data decomposition and communication between processing steps. 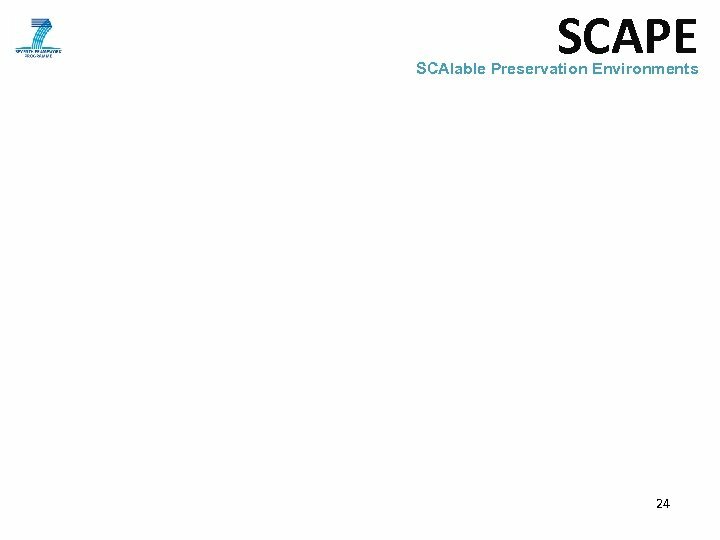 • Applications benefit from built-in support for data-locality and fail -safety. 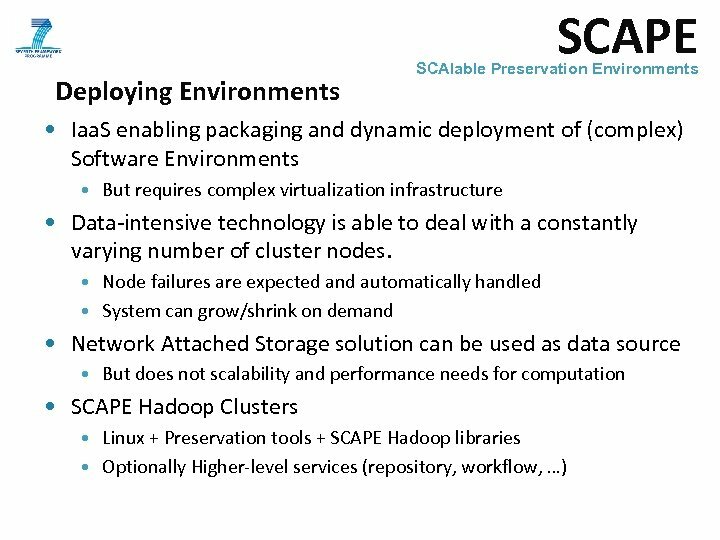 • Applications scale-out on big clusters processing very large data volumes. 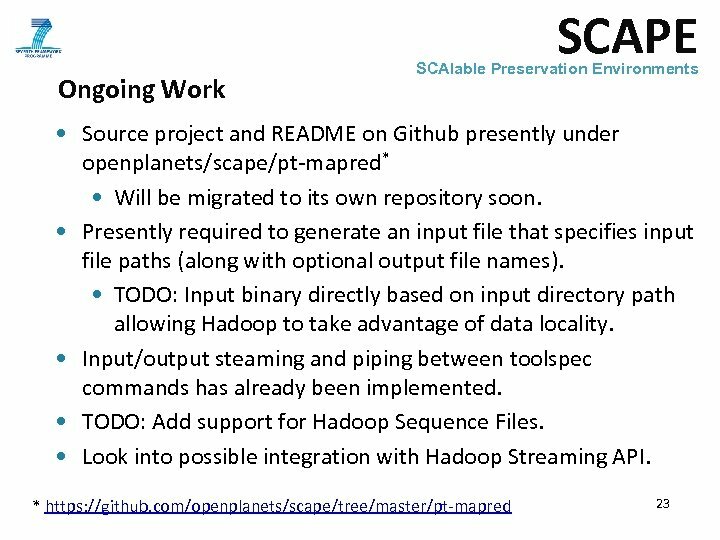 SCAPE SCAlable Preservation Environments • Wrapping Sequential Tools • Using a wrapper script (Hadoop Streaming API) • PT’s generic Java wrapper allows one to use pre-defined patterns (based on toolspec language) • Works well for processing a moderate number of files • e. g. applying migration tools or FITS. • Writing a custom Map. Reduce application • Much more powerful and usually performs better. • Suitable for more complex problems and file formats, such as Web archives. 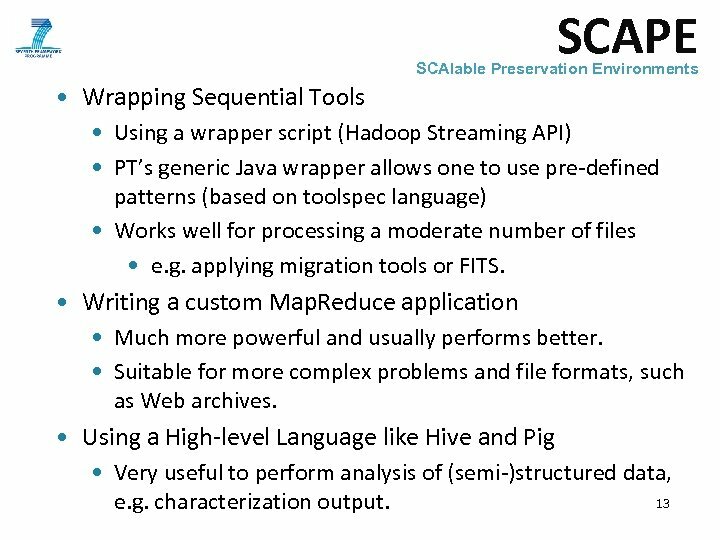 • Using a High-level Language like Hive and Pig • Very useful to perform analysis of (semi-)structured data, 13 e. g. characterization output. 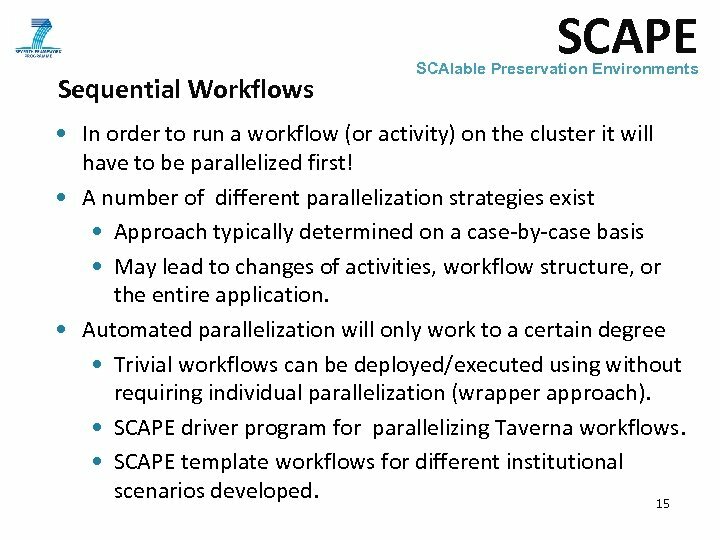 SCAPE Parallel Workflows SCAlable Preservation Environments • Are typically derived from sequential (conceptual) workflows created for desktop environment (but may differ substantially!). • Rely on Map. 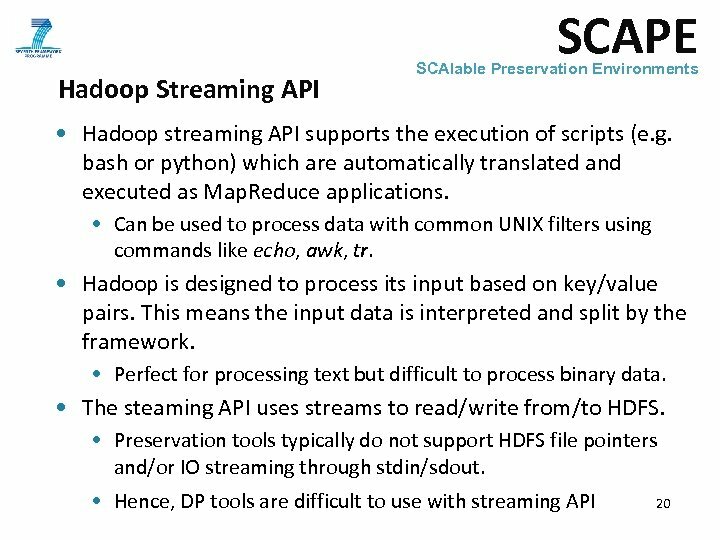 Reduce as the parallel programming model and Apache Hadoop as execution environment • Data decomposition is handled by Hadoop framework based on input format handlers (e. g text, warc, mets-xml, etc. ) 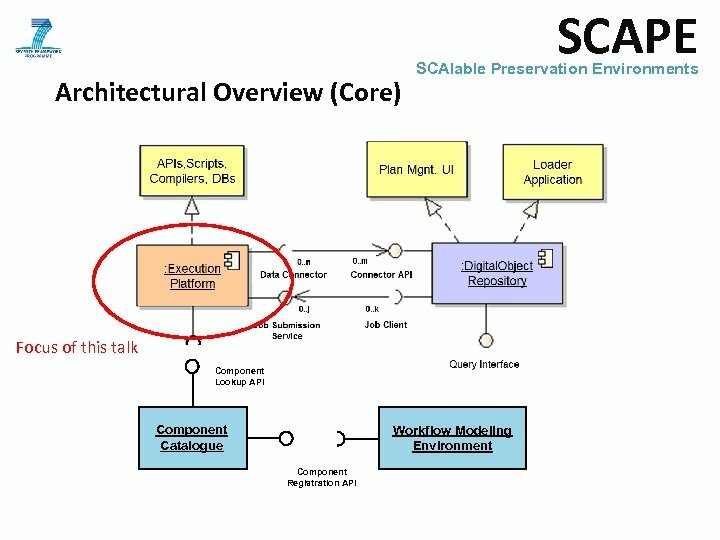 • Can make use of a workflow engine (like Taverna and Oozie) for orchestrating complex (composite) processes. • May include interactions with data mgnt. 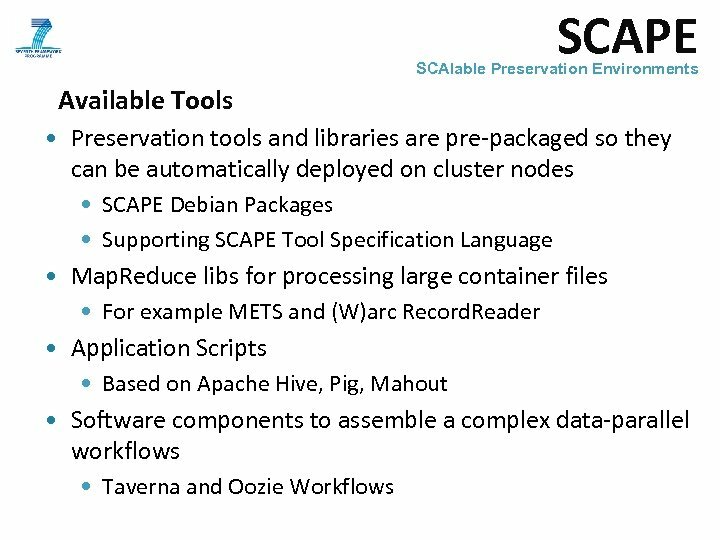 sytems (repositories) and sequential (concurrently executed) tools. 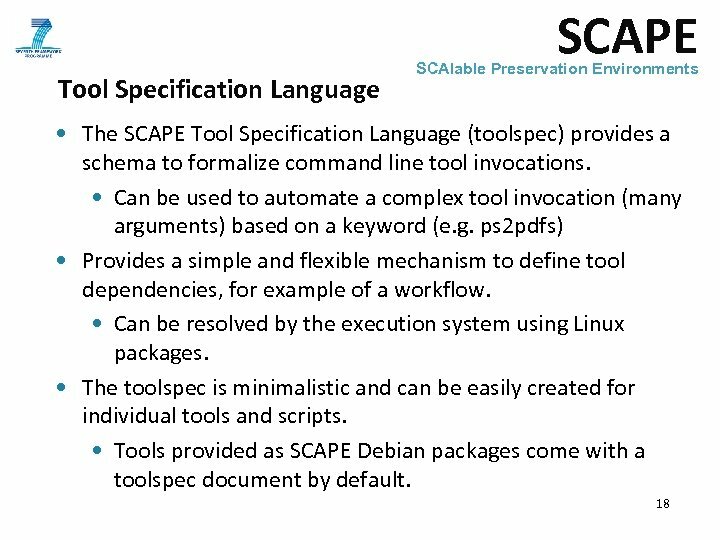 • Tools invocations are based on API or cmd-line interface and 16 performed as part of a Map. Reduce application.